Each of the articles in the volume touch on questions of governance: by addressing how we use and assess evidence-based research aimed at improving policing practice; looking at the role and performance of the Western Cape Police Ombudsman; examining how and where protests focused on weak or absent governance take place; and unpacking the latest version of the Traditional Courts Bill, which is before Parliament (after two previous failed attempts) and which aims to regulate the customary justice environment. 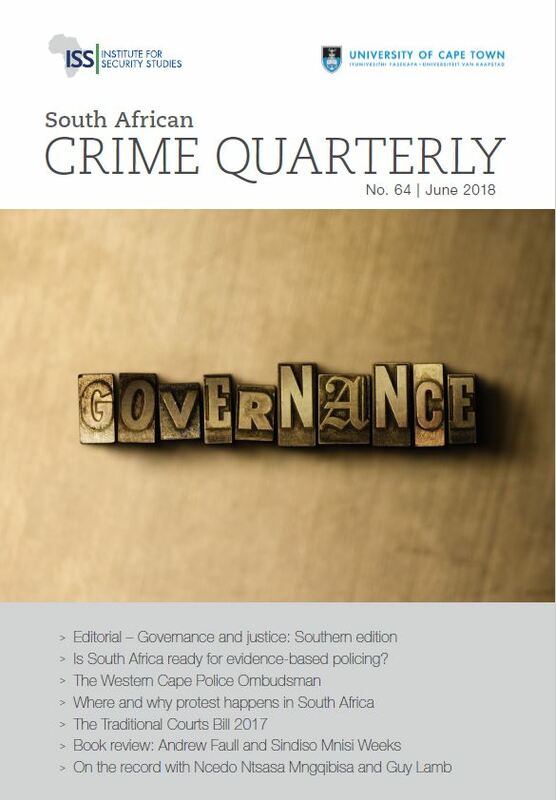 Gareth Newham and Brian Rappert’s article, Policing for impact: Is South Africa ready for evidence-based policing? reflects on the ways in which research aimed at improving operations has realised its potential to shape policing in practice. They document a shift towards ‘greater engagement and collaboration with partners external to the police on research and data’, and argues for dedicated research partnerships that could ‘better enrich SAPS exposure to new knowledge and interventions’. Lukas Muntingh reflects on the office of the Western Cape Police Ombudsman, and looks at its powers and performance since its inception. Muntingh finds that the body faces a number of challenges, including a ‘tiny’ budget, small staff, limited capacity to investigate, and low levels of confidence in its independence and effectiveness in addressing the poor policing and police-community relations that are evident in the province. Lizette Lancaster presents data from the Institute for Security Studies’ Protest and Public Violence Monitor (PPVM) in her article, Unpacking discontent: Where and why protest happens in South Africa. The data shows that, contrary to prevailing public narratives, protests in this period have most often been related to industrial strike action, rather than service delivery concerns, and only just over half (55%) have been classified as violent. Taken as a whole, the PPVM data shows how wide-ranging protest grievances are, and how geographically widespread they are. Fatima Osman’s article, Third time a charm? The Traditional Courts Bill 2017, looks at the latest version of the Bill and asks whether it sufficiently addresses the fundamental objections to previous versions, and the public outcry and sustained pressure from civil society organisations that ultimately scuppered its passage. Osman finds that these concerns – largely centred around the gender composition of the courts and women’s participation in dispute resolution processes, the centralisation of power in traditional leaders, and the professionalisation of courts – have been attended to in some measure in the new Bill, but that critical issues warrant further attention. Bill Dixon reviews two books for this issue of SACQ: Andrew Faull’s ethnography about the working lives and professional identities of the South African Police Service members entitled Police work and identity: a South African ethnography; and Sindiso Mnisi Weeks’s in-depth exploration of what she terms ‘vernacular dispute management forums’ in Msinga in rural KwaZulu-Natal, called Access to justice and human security: cultural contradictions in rural South Africa. ‘On the Record’ discusseS the in-the-field realities doing of doing a randomised household survey with Guy Lamb and Ncedo Mngqibisa from the Safety and Violence Initiative at the University of Cape Town. Policing for impact: Is South Africa ready for Evidence-Based Policing?